↑ Allana, Gulam (1988). Muslim political thought through the ages: 1562–1947 (2 संस्करण). Pennsylvania State University, Pennsylvania: Royal Book Company. प॰ 78. http://books.google.com.pk/books?id=4nbiAAAAMAAJ. अन्तिम पहुँच मिति: 18 January 2013. ↑ Hasan, Mohibbul (2005). 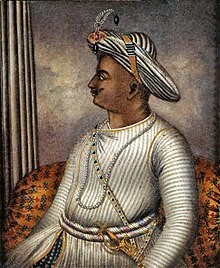 History of Tipu Sultan. Aakar Books. प॰ 399. . http://books.google.com.pk/books?id=hkbJ6xA1_jEC. अन्तिम पहुँच मिति: 19 January 2013. ↑ R.k.datta (2007). Global Silk Industry: A Complete Source Book. APH Publishing. प॰ 17. . http://books.google.com.pk/books?id=A8U1lmEGEdgC. अन्तिम पहुँच मिति: 22 January 2013.